As nice as it is to swoon over enduring Trek unions like Riker and Troi or Tom and B'Elanna, what about those spicy short-lived affairs that burnt brightly if only for a moment? In celebration of Valentine's Day 2017, hosts Cam Smith and Tyler Orton are on hand with their picks for the franchise's finest and direst single episode love stories. 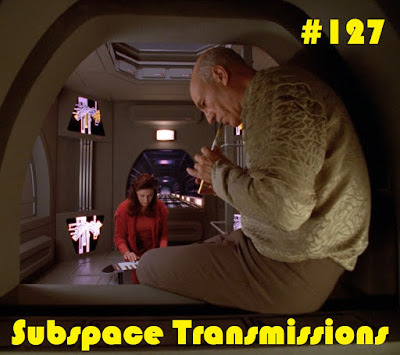 From the highs of Picard and Daren's musical connection and Kirk's tragic encounter with Edith Keeler, to the miserable lows of Harry Kim's post-coital bioluminescent affliction, the duo honor the episodes that serve as both a warm tribute to the holiday, as well as an uncomfortable affront. Plus, as a special value bonus, the Subspace crew and their witty band of fellow Vegas 2016 attendees reveal their Star Trek crushes! Wanna appear on the show? Shoot us a 30 to 60-second audio clip telling us what you think are STAR TREK'S BEST AND WORST FLINGS OF THE WEEK and you could take the spotlight in an upcoming program! You can also send any other questions, topic ideas or feedback to subspacetransmissionspod@gmail.com! Join us next week as we determine Trek's most superior and inferior seasons.